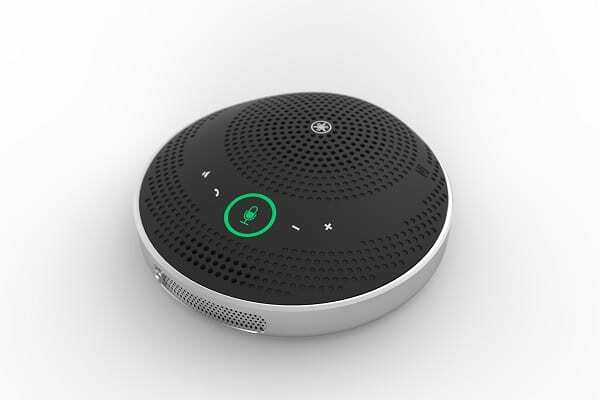 Yamaha has announced the launch of its YVC-200 portable USB + Bluetooth speakerphone that has been designed for on-the-go workers. The portable conferencing unit fits in the palm of the user’s hand and is integrated with Yamaha’s sound processing technologies. These include adaptive echo cancellation and Human Voice Activity Detection, which focuses the unit on speech rather than background noise. The YVC-200 also features intelligent microphones that deliver full-duplex conversation without sound drop-outs, as well as powerful, built-in speakers that deliver audio that sounds true to life. “The reality of today’s global workplace is that people are meeting and collaborating outside of dedicated conferencing spaces, which can create a challenging and increasingly frustrating meeting environment,” says Yamaha Unified Communications vice president of business development and product management Phil Marechal. Users simply connect the YVC-200 to their audio, video or web conferencing client to start a remote meeting anytime, anywhere. The YVC-200 is equipped with USB and Bluetooth, with fast pairing to NFC-enabled devices so it can connect to a PC, smart phone or tablet. Frequently used functions, such as microphone mute and speaker volume are controlled by interactive touch-sensor buttons for easy and intuitive operation. The YVC-200 is operating system agnostic, fully compatible with commonly used OSs and remote conferencing systems, and has a built-in rechargeable battery that provides up to 10 hours of operation. It is being exhibited at the Yamaha Unified Communications booth N1228 at InfoComm 2018 at the Las Vegas Convention Centre.